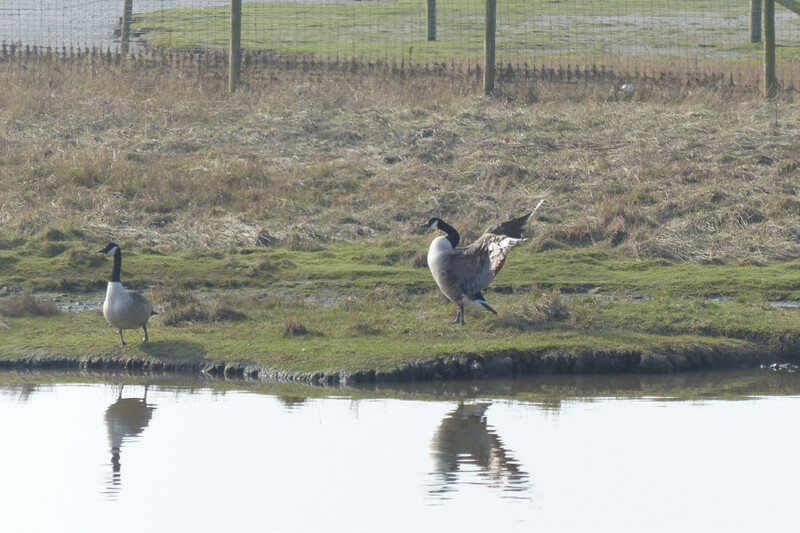 After much posturing and aggression between several pairs of geese one pair of Canada Geese finally began nesting on the scrape pool at Pickerings Pasture. 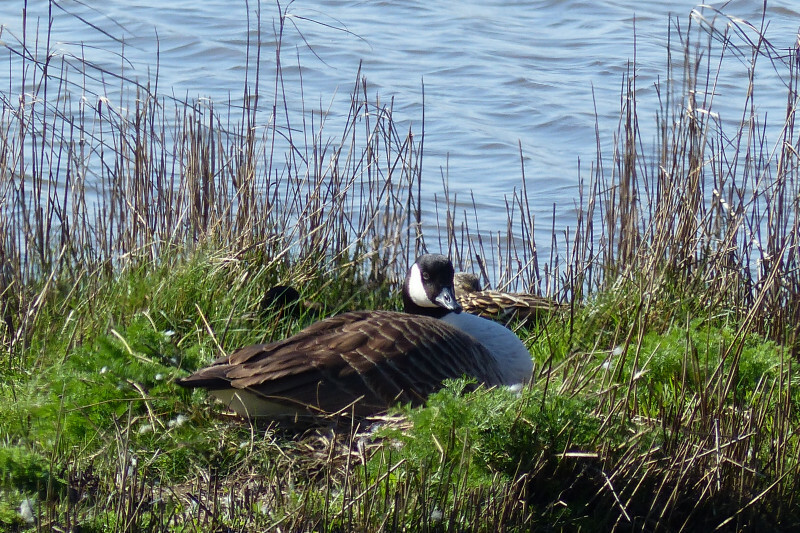 Around the 9th April 2015 we noticed that she had eggs and was sitting on her nest. The male spent most of his time either swimming around the pond or standing guard on the bank nearest the fence. The gander posturing at another pair of geese nearby. The goose sitting on her nest. On 19th April there was a 10 metre tide, which we knew would inundate the scrape pool and the nest. Once the tide had encroached into the pool it came in very fast and the island was soon going under water. We watched as the tide went over the nest: the female had her head under the water and she appeared to be doing something with the eggs. Finally the tide went completely over the nest and the female just floated away. The male immediately swam over and they swam together around pond. The tide had not reached its maximum but we left shortly afterwards. 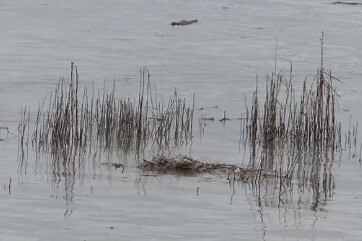 We understand the nest was submerged for over half an hour. 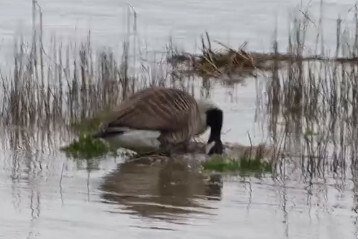 The goose appeared to be turning her eggs underwater. About 20 minutes before high tide. The female swam around the nest area. The female sitting again. The nest has moved slightly to the right. We were surprised, when returning the following day, that she was still sitting on her nest and we saw her turning the eggs: however the nest had moved to the right before getting caught in some long grass. There was another 10m tide that day. Because it had less wind behind it was slower to cover her nest and it was only submerged for about 25 minutes. This time she vacated the nest before the tide completely covered it. Much to our amazement we found her sitting on the nest the next time we visited and she continued to incubate into May. 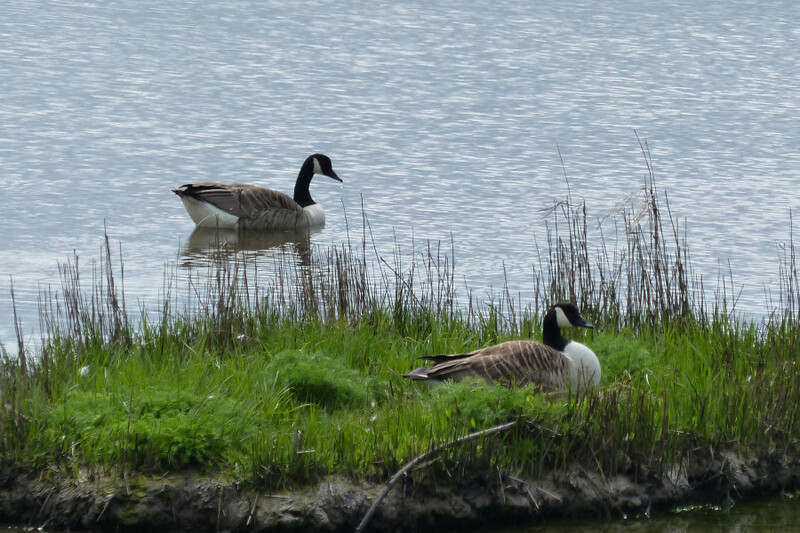 In view of the tidal inundation we had no hope of any goslings hatching from the nest. 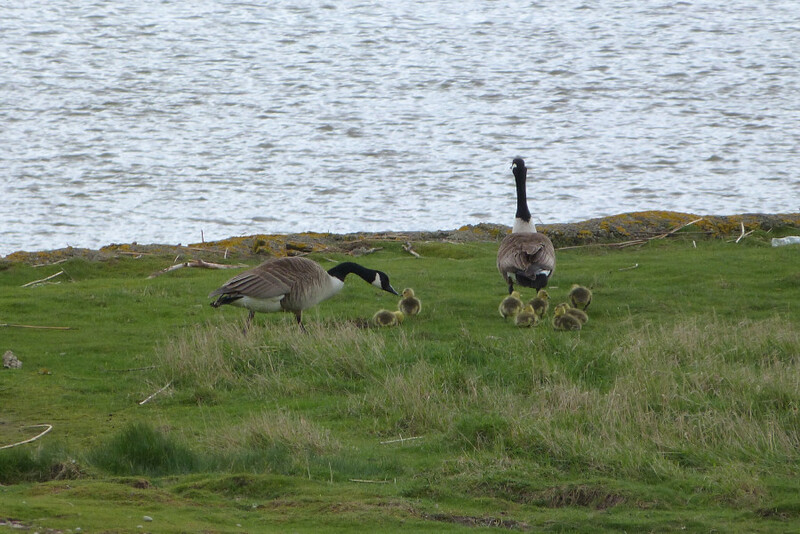 We are not sure exactly when the goslings hatched but they were seen leaving the island on Saturday, 9th May. 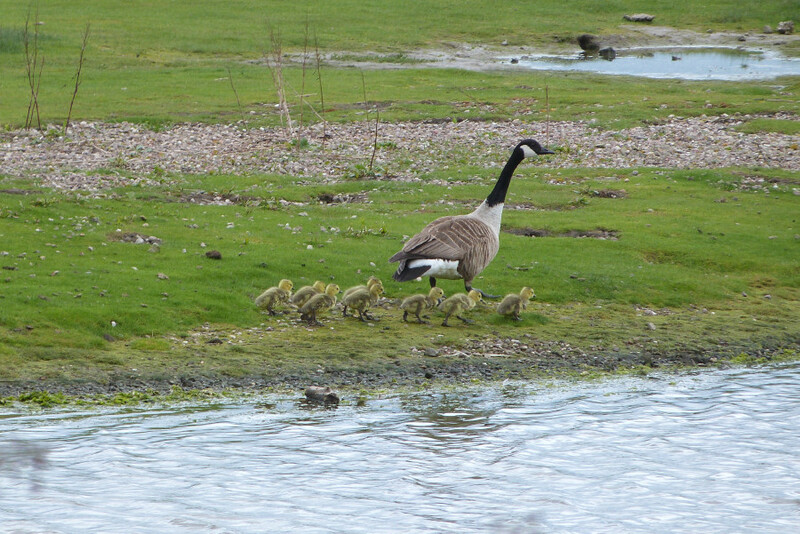 Unbelievably nine goslings had hatched, although one soon disappeared. 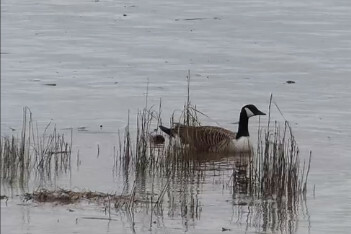 They were seen feeding on the area between the scrape and the river during the next 24 hours but eventually the pair took them onto Hale Marsh were the majority of Canada geese congregate. Feeding out on Hale Marsh the next day. We, and many people we have spoken to, have never heard of any eggs hatching after being under water for so long. Perhaps history has been made!! Thanks to Ruth for the use of her photos and Vincent for the use of his video..